"One of the best suites for the price!" Have a question for Luxury Suites International at The Signature? "Nice sized room in a good location, includes a kitchen, in the heart of the action yet quiet, without the feeling of being in a big hotel, but right there when..."
"Overall, the experience is good, will difinitely visit again." "Staff are friendly and hospitality." 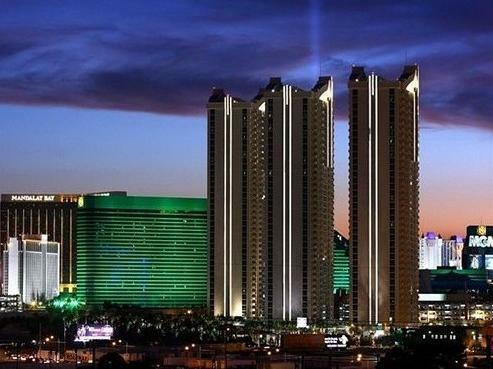 "Had a lovely stay in Vegas really liked the Signature as a l..."
Ideal for fun and relaxation, Luxury Suites International at The Signature is located in the The Strip area of Las Vegas (NV). From here, guests can enjoy easy access to all that the lively city has to offer. With its convenient location, the hotel offers easy access to the city's must-see destinations. Luxury Suites International at The Signature offers impeccable service and all the essential amenities to invigorate travelers. Guests of the hotel can enjoy on-site features like 24-hour room service, 24-hour security, 24-hour front desk, luggage storage, valet parking. Guests can choose from 125 rooms, all of which exude an atmosphere of total peace and harmony. The hotel's fitness center, outdoor pool, spa are ideal places to relax and unwind after a busy day. Enjoy unparalleled services and a truly prestigious address at the Luxury Suites International at The Signature. 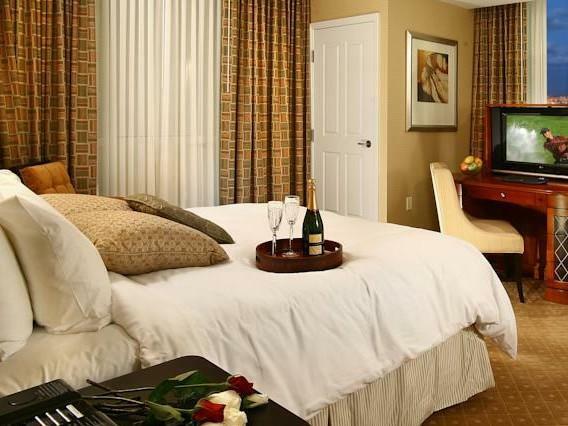 "We got the Jjunior suite which was excellent A"
The property does not provide housekeeping service. Chose the Signature Suites as we were having a 6 night stay in Las Vegas and wanted a bit of room to move. Couldn't have been happier with the location, with direct access to the MGM Grand and all it has to offer, and step straight on to the monorail to explore Vegas and cut down on some of the walking. Stayed in Tower 1 and it is closest to the great walkway that takes you in to the MGM Grand. Its a long indoor walkway so even as a woman coming and going a lot alone I felt completely safe staying here. 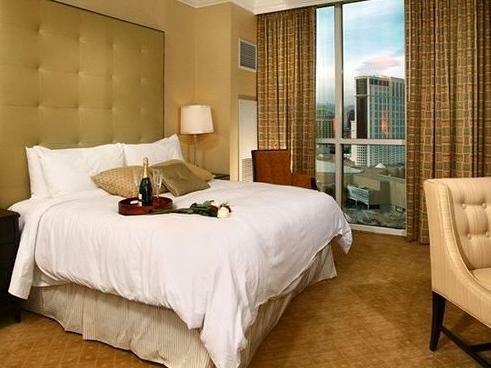 The room was very spacious and well appointed, very quiet and clean with a huge window overlooking Las Vegas. Wouldn't hesitate to stay here again. Number one benefit - No casino within the Signature so it is lovely and peaceful. Was winter so didn't get the chance to check out and use the pool facilities. The junior suite (or penthouse at Signaure MGM) is a great big room, with very generous amenities, including a jacuzzi in a huge bathroom. Bed was really comfortable too and the room has its own basic kitchen furnishings. Really wonderful stay! The location is not bad, has inner walkway to the MGM grand out to the strip. Parking is free for overnight guests but the room is outdated, carpet really dirty and shower drains very slowly. Also the hotel has rigid check out time, if you ever need a late check out, expect to pay for it. For the price I paid for this hotel, I would choose to go elsewhere. I loved the room and everything about it. I loved the service from in room dining. Only thing that bothered me was there was 4 people standing at the front desk and they were all too busy to help out the growing line of people standing in the lobby. Large suite, well appointed and located. All facilities close to hand via walkways. MG Resort area included and is excellent. Disappointing local cafe and room service. Poorly stocked local shop which was ridiculously expensive with no prices shown. Though a bit worn, the room and property are in good condition. I especially liked the condo-aspect with a small refrigerator and microwave. I had a strip view (pleasant surprise) but I heard the other side with a view of the airport is not so great. I liked the balcony, large spa-tub, and the fact that all the rooms are somewhat close to the elevators, thus no long hallway walk to my room. Valet attendants were modestly friendly, but hotel agents at the desk were more personable. Overall a pleasant experience, and very happy for free valet and gated entrance. So nice to get away from the hussel and bustle of the Vegas strip, yet so near to everything! Pools great, facilities very good, gyms, Signature bar, Starbucks and a great little Deli for nice food. Highly recommended! We were assigned Tower 3 that was operated by a "Contractor", the rooms are old and have very low maintainance, toilet seat was broken, mold on the shower head and jacuzzi wasnt working properly, buttons on door and lock on the door sometimes did not work, at the checkout the fron desk wanted me to pay 20$ for every item that was delivered to me, no one specified that before, i refused to pay and they did not charge me but others beware! I decided to book through LSI as it was a massive saving on booking with MGM directly. you get all the same things and access to MGM Grand etc. our room was in tower 2. it was very run down. the carpet was nearly thread bare and really deity, very bad damp on the curtains at the balcony area, dust everywhere. the best was changed and made up during our stay and ot was very comfy but if I was to book again I think I'd book via MGM. only because you have the option to upgrade at the desk and if you have any problems at least they are on hand to sort it. you can't get help at reception if you book via LSI you have to call an outside line and wait for someone. on the first night out balcony wouldn't open the lady said she would send house keeping up. when we got back we have another supply of fresh towels but the balcony still wouldn't open! we eventually got it ourselves. overall a good room if the carpet etc was replaced. connected to the MGM Grand and the walk really isn't far. the jetted tub is great and the bed comfy. we were a little disappointed I had made them aware it was a surprise holiday for my boyfriends 30th and they hadn't left anything complementary like other hotels! One thing that looked really cool turned into a gross disappointment. The oversize jetted tub. Upon filling it up, there were chunks of "gunk" that were all in the tub. It was horrible. Then we tried again the next day thinking maybe it all got cleaned out. Nope. Disappointing. Large apartment with shower jacuzzi bath very comfy bed clean towels sheets & good room maid. Paid extra for balcony but was unable to open patio door also no patio furniture.We we’re in room 705 in tower 2 the carpet was extremely dirty and stained lack of cooking pots only 2 small tea cups had to buy mugs only 1 pan! This room needs urgent update it wouldn’t cost much! My son & his partner we’re in tower 1 they had no balcony but had new carpets lots of trendy pots& pans. I was disappointed with our room. Tried to check in at 2.45 pm but had to wait until 3pm although the room was ready. It was disappointing that we had to wait 2 hours to check in without an option to pay for early check in. We had to call to request privacy in our room since the Do Not Disturb and Housekeeping lights did not work. The most upsetting part was that the cold water faucet in the tub did not work. The main reason we selected the room was for the Jacuzzi tub that we were not able to use. I would recommend the hotel to friends but not to go through a third party as the standards are not equal. One of the best suites for the price! Had a lovely stay in Vegas really liked the Signature as a little off the strip and one place that was no smoking! Would definitely recommend and return if in Vegas!! Great choice to stay for vegas !